Well, it has been quite some time since the year 2000 that we have been working as a florist. 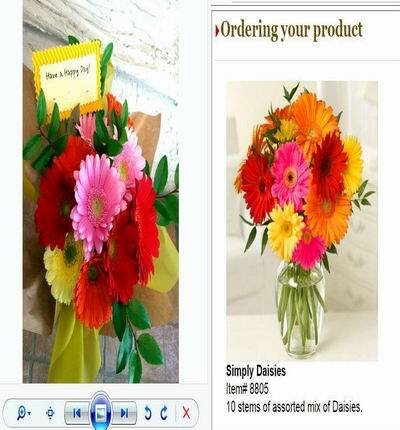 We had a lot of interesting stories and experiences throughout the years running the online flower shop. It sometimes can be very challenging but it is quite rewarding especially when our customers send us emails with compliments and positive feedback. 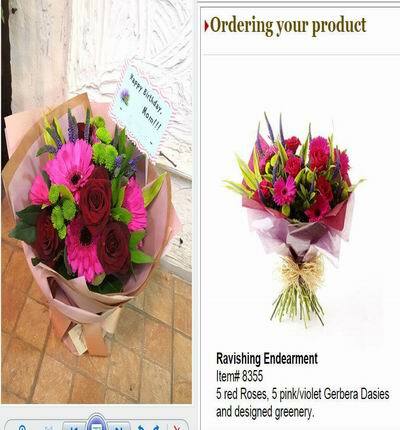 Sometimes our florists or delivery companies make mistakes and we always try our best to resolve complaints and issues as fast as possible. 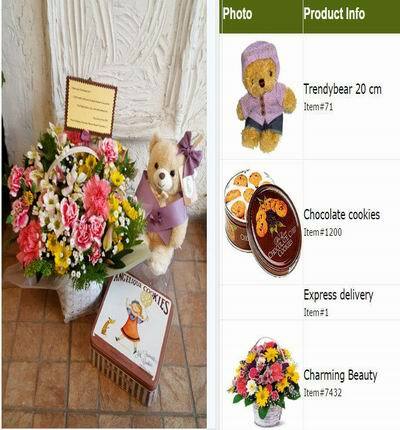 Here is a little review blog about our online products and our florist in Thailand. Please have a look at some of our past orders and the comparison of what we sold online versus what was actually delivered. We will continue to work hard and provide services throughout Thailand and areas such as Bangkok, Chiang Mai, Phuket, Pattaya, Chanthaburi, Mae Sot, Nonthaburi, Ratchaburi, Udon Thani . HAPPY FLOWERS: Here are fresh daisies delivered. 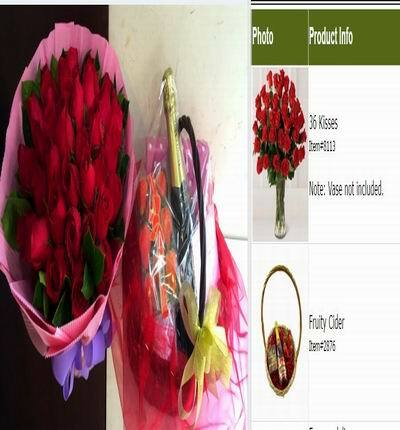 The flower colors, fillers and design has been carefully designed. I understand that the image of what is on the internet versus what is actually delivered may not always be exactly the same but our florist will do their best to make it similar as much as possible. One thing nice about daisies is that the petals are well spread out creating a very nice open feel. Also the colors are often very bright with a happy feeling. SHARP & BRILLIANT MIXED BOUQUETS: This order of flowers were carefully chosen paying attention to the color coordination. The combination of violets, reds and greens created a sharp contrast and brilliant feel. This kind of arrangement is very striking and noticeable. 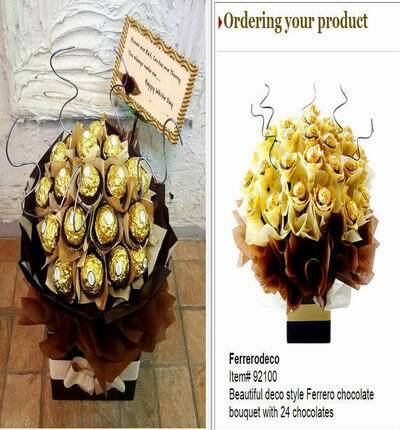 MODERN CHOCOLATE BOUQUETS: This Ferrero chocolate bouquet was designed to give an elegant and modern feeling. The golden shine combined with the dark brown body provides a sophisticated contrast. Unfortunately, this chocolate bouquet is not always available or our florists are not always able to make it. If it can be made, it does take some time to make so advanced ordering is usually needed. HEALTHY FRUIT BASKETS: This is very simple fruit basket and to the point. Fruits are thoughfully placed in the basket. It's almost like something you would see in an artist's painting. Sometimes the recipient of this kind of fruit basket will think it's too bad it has to be eaten. Regardless, the fruit baskets are a great healthy gift combined with sweet, sour and tangy flavors. 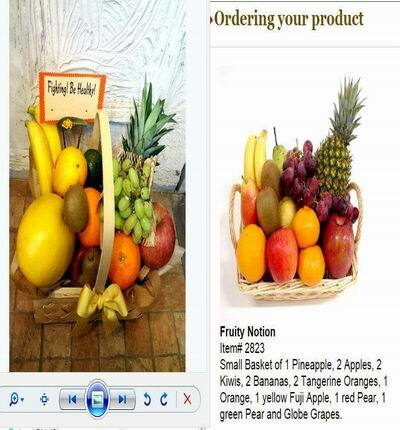 Fruit baskets are often sent to parents, friends, schools, hospitals and houses. It's an enjoyable snack and it's pleasurable to see. YUMMY SWEET CAKES: This fruit cake was designed using kiwis, peaches and strawberries. 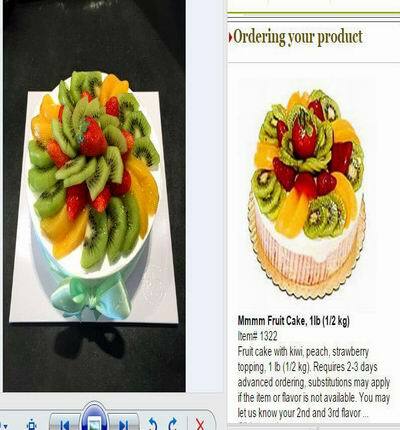 The fruits were not only for nutritional value but to accent colors of fruits with the cake. Cakes are often ordered for birthdays. There are a few choices of birthday cakes but healty fruit cakes are a great option. Normally, the cake can feed several people so if the cake is sent to an office, it will most likely be shared among the recipient's colleages and co-workers. Please note that most of the time, writing cannot be written on top of the cake. So the best way to send a note is to write something in the greeting message. While filling out the order, there is a place to write the Greeting message. The greeting message is an important part of the gift as it adds meaning to the overall gift. So it's probably a good idea to spend some time thinking of what to write. Sometimes writing a message with some humor is good too. Making someone smile is a great idea! 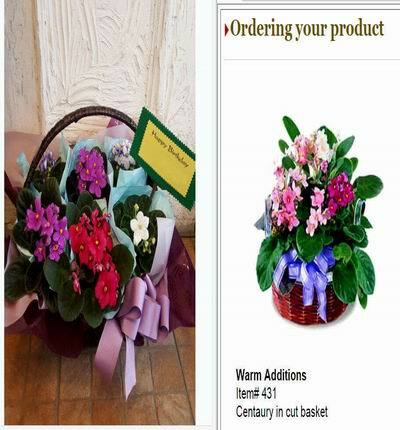 WARM FLOWER BASKETS: This basket of flower plants were arranged to give the recipient a warm thoughtful feeling. It's something that can be kept in places such as the kitchen where the recipient can sit nearby and admire and think about the sender's thoughtfulness. Flower plants are great to have because they can last longer. 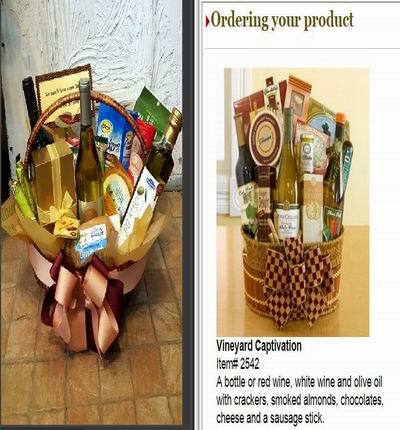 QUALITY GIFT BASKETS: Gift baskets is an exciting option of gifts for recipient to enjoy. A lot of businesses and companies send gift baskets to their clients. Much of our gift baskets will not be exactly the same as the items on the website because the items are always purchased in local markets which the products continually change. Also depending on the delivery location, the markets may only have certain products. So the florist needs to work hard to get similar products. If not available, they will use other substitutions. The items will be similar in value and quality. The end result of the baskets will be impressive and well designed. ORDERING MULTIPLE ITEMS: Here are an example of an order with multiple items in the online shopping cart. Sometimes the heart shape Ferrero chocolate is not available which a substitution will be used. It might be a square box or a heart shaped box of a different brand. 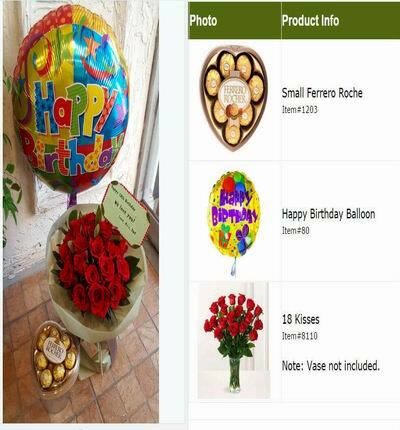 The balloons are not always the same design but our florist will try to arrange something similar. The roses will always be fresh, purchased in the morning of the delivery. Our florist does not aways print out their card and often hand write the greeting message. When flowers are ordered without a vase it will be wrapped in simple wrapping. There are options to add deluxe or premium wrapping which the flowers will then be designed with more wrapping paper and more fillers to add a nice extra touch. FLOWER & PRODUCT SUBSTITUTIONS. Sometimes when certain flowers are not available our florist will make substitutions of the flowers however they will try to make the design similar as much as possible. The florist won't substitution main flowers such as changing roses to tulips or lilies to sunflowers. There are many times where the local markets do not have the same cookies so our florist will find something suitable for the substitution. And much of the time the teddy bears are not going to be the same because the teddy bear stock always changes. So the teddy bears will still be very cute with good quality but the brand and design will often change and substitutions made. WRAPPED ROSES & GIFT BASKET. When roses are ordered without vase, it will be nicely wrapped. With Gift baskets it may include some kind of wrapping around the basket to keep the items in place.